It always seems to take an eternity for these new queens to get laying and the spectre of queenlessness and laying workers rears its ugly head. But when you sit down and actually work it out it, it’s often your expectations that are out of whack. Remember she matures for 4 days after she emerges then even if she goes straight out and mates she won’t start to lay for another 4 or more days after that. So don’t waste your time looking for eggs till she’s 2-3 weeks old because if she’s not laying before then there’s nothing you can do about it anyway except gnash your teeth. 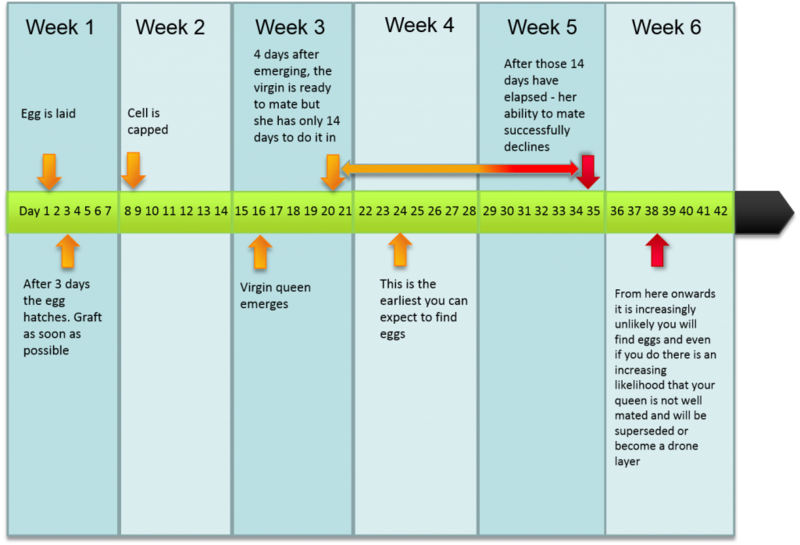 Have a look at this diagram instead – it’ll help keep your expectations on track. Click it for a bigger version.